The modern general hospital is a tribute to the ingenuity and progress of modern medicine. When one of us recently visited a friend in the hospital being treated for heart disease, we pondered how patients across the hallway could have cancerous tumors removed or be treated for chronic diseases such as diabetes. This hospital had one of each of the most modern technologies with which to diagnose and treat any disease for any patient. With those technologies, fearsome diseases that were once a death sentence are set in abeyance and lifespans increased. And yet, despite the wonder of modern medical technology and human compassion on display in general hospitals, runaway healthcare costs in hospitals like the one we visited are threatening to bring our economy to its knees. Does the cost come from these advanced technologies? Does it come from overpaid specialists? Or is there some hidden waste in the system that just needs to be squeezed out? The answer to these questions lies in understanding basic business models. In trying to be everything to every patient, the general hospital has conflated two business models, a Solution Shop and a Value-Adding Process (see info boxes). These two business models cannot effectively coexist because their respective processes and profit formulas are in conflict. Hospitals’ business models have not adapted to the change from Intuitive to Precision medicine. They are typically organized as Solution Shops, where doctors diagnose and treat patients in an intuitive fashion, following the scientific method until they identify an adequate treatment. This was appropriate in the early stages of medical understanding when diseases like polio were poorly understood or when HIV was initially discovered. However, as medicine progressed Polio was effectively eradicated while HIV has become consistently treatable. Once we understand the causal mechanism of a diseases or condition and predictably effective treatments become available, treatment can be shifted into a Value-Adding Process (VAP) business model. These businesses take consistent inputs and use consistent processes to deliver consistent results. Thanks to technology and standardization, less credentialed providers such as nurse practitioners and physician assistants can competently perform tasks doctors used to manage, such as giving vaccinations, testing for strep throat or treating allergies. This standardization reduces complexity and cost. An example from the automotive manufacturing industry illustrates the problematic cost of complexity in general hospitals. The Michigan Manufacturing Company’s (MMC) Pontiac plant was responsible for performing all the odd-jobs in the MMC system, not unlike our friend’s general hospital. The plant boasted one of each machine and was flexible enough to build any part. Unfortunately, this plant was in danger of being closed because it had an overhead to direct labor expense ratio of over 6:1, compared to 2:1 for some of the system’s more efficient plants. The Pontiac plant was run down and understaffed, while the lower-overhead plants had extra secretaries and newly landscaped buildings. Where did Pontiac’s extra costs come from? The plant’s forewoman discovered that overhead increased cost twice as fast as economies of scale decreased cost when adding new product lines to the plant. Pontiac’s 20 distinct product lines created the highest overhead burden of any plant in the system. The process of coordinating so many products through distinct, often customized production pathways led to tremendous costs of complexity and constant re-tooling. Overhead costs were drowning the plant. While there are some meaningful differences between an automotive plant and a hospital, leading patients through a hospital is much like leading an automotive part through the Pontiac Plant. Coordinating manifold patient pathways creates enormous diseconomies of scope, patient outcomes suffer as “re-working” must be done, and costs soar as a result. 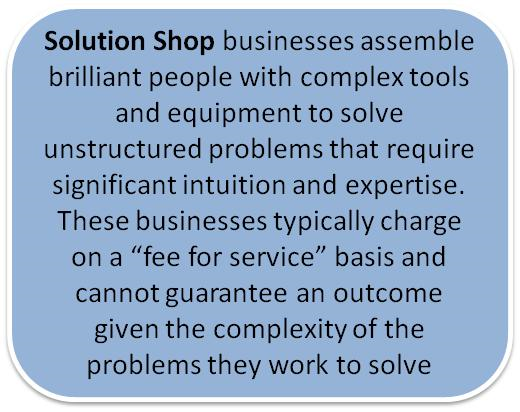 Solution shops are an inherently expensive businesses because they solve complex problems. When surgeries are performed in a Solution Shop, they carry the same staggering overhead costs as the Pontiac plant. If the standardized, effective, high volume processes can be stripped out of the hospital, they can be performed at a much lower cost within a systematic VAP business, and leave behind a simpler solution shop. Hospitals are well suited to perform complicated and expensive Solution Shop work, but we need to set the VAPs free from the solution shops and dis-aggregate the general hospital business model. Hospitals can no longer afford to promise to do “everything for everyone” that walks through their doors. Outside the hospital, less-credentialed providers can perform standardized, routine procedures at lower cost with equal or better quality outcomes. Modern medicine has made fantastic strides over the past century. Our friend was diagnosed and treated in a hospital that could treat heart disease, cancer, and diabetes. Going forward, we cannot afford hospitals that confuse business models. Once he was precisely diagnosed, he should have been sent to a heart disease specialist where he could receive an angioplasty at a much lower cost. That is a big part of how we will make health care more affordable. Note: See the Innovator’s Prescription for more thorough analysis of the general hospital business model.